"Sometimes simplicity is just the ticket. I had fallen in love with the contoured body of the 1954 Precision basses, and using the one pictured above as my guide, I built my own in medium scale, finished by Pat Wilkins and set-up by Patrick Cummings. I couldn't be happier with this instrument - it plays and sounds like a dream. After Patrick finished setting it up, I could barely wrench it from his hands. His remark was: "Very rarely, when the wood is exactly right, the neck is exactly right, and the electronics have the proper "bark" - everything somehow comes together and creates a completely magical instrument. Happily, this is one of those basses." I recently finished this 1954 Precision Bass in medium scale using the photo directly above as my inspiration. I have never had a full-size long scale body with a medium scale neck on it, as Fender Japan always downsized the bodies and narrowed the necks slightly on their medium scales. In 1954 Fender modified the original "slab" body by adding contours on both the front and the back of the bass body. 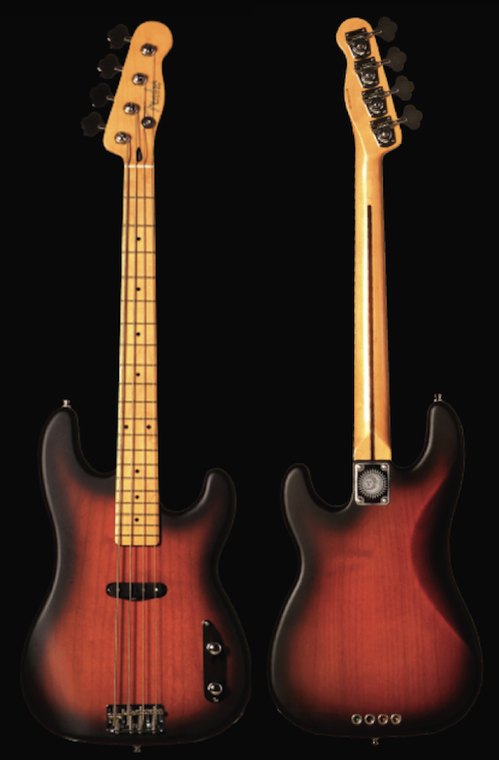 They kept the same body thickness as the original "slab" bass and it wasn't until later that they began to make the body slightly slimmer as in the modern version of the Precision Bass we see in the stores today. Since my 1951 P Bass is ash, I wanted to create this one out of alder. My 1951 has Lindy Fralin pickups, so I wanted to use vintage Duncans on this one. I use flats on the 1951 so I wanted to try half-rounds on the 1954. Alder was also the wood of choice for the 1954 models, as Fender discovered that it sounded fine and was a little friendlier than ash was - as far as applying the finish goes. It didn't require as much filler in the grain, so it was less labor intensive. So, I had a body made for me and I decided to use a full size Fender body. I had the jack, pickup and control cavity routings done, but no neck pocket and no bridge routs. I have to get the bridge placement exactly right for the 32" scale, and for this reason, I also had them hold off on drilling the ground wire channel. The body is two-piece light, dry, nicely figured alder. I picked up a Fender Squire Vintage Modified Telecaster bass neck off of ebay for a cool $149.00. I love these necks, they are wider and much closer in size to the standard Fender neck - than the medium scale necks coming out of Japan. In fact, the neck width at the pocket is only 1/8" narrower than a full size neck and needs no major modifications on either side to fit on a standard Fender body. Please note: I am NOT saying that the necks are interchangeable with full scale, or any other Fender bass neck - they are NOT. I am simply commenting on the fact that the width of the standard Fender body at the neck pocket is correct without any modifications to accept this specific medium scale neck. You still need to start from scratch and create your own neck pocket, which is no small task.. The standard Fender neck pocket is close to 2.5" while the standard medium scale neck pocket is approximately 2.25". One of my favorite features is that this neck has the frets pounded right into it - old school - with no fingerboard. I shipped the neck off to John Ingram formerly of PRS and he and his staff went over the neck completely - giving it their stamp of approval - and then stripped the gloss finish off the neck, sprayed a little vintage tint and finished it in beautiful satin. Below is a photo of the neck in the exact position required for the medium scale fit. Notice, instead of the top of the pocket being at the 6th fret from the top, - as illustrated in the full scale model above - it needs to be at the 7th fret from the top. This will result in a slightly deeper neck pocket. It will also cause the pick guard shape to be modified to embrace the slightly deeper neck pocket. I am using a Seymour Duncan "Stack" single coil pickup for this project. 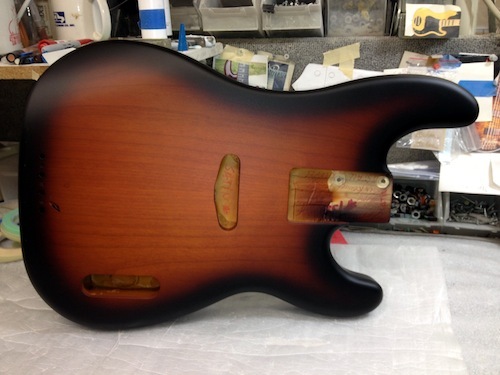 I have a Lindy Fralin in my 1951, but I want this bass to have a different edge than the 1951. I think I can accomplish this by the combination of the Duncan and the alder body. I am planning on using my trusty D'Addario Half Rounds on this bass, although I am sure some experimentation will take place. The 1951 has Labella Flats. Here is a photo of the body showing the exact bridge placement, with the pickup and the control plate in place. As you can see I have a vintage Fender "through the body type" American Standard bridge sitting on the bass. 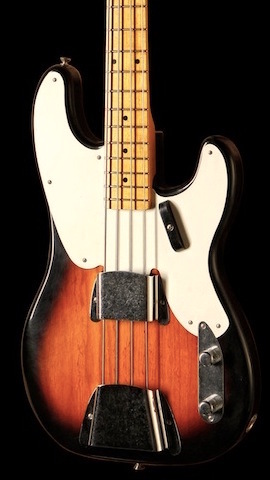 I am very leery of the vintage two saddle bridges that were a hallmark of this bass back in the day. I have hassled over them quite a bit, and with my brand of perfectionism, I have never been able to intonate the bass exactly to my liking with those vintage bridges. Having said that, I do have one available. I really like the Fender bridges which are knurled continuously across the saddles, in case you need to increase or decrease the amount of space between the strings. I was thinking about the Wilkinson swivel bridge saddles, but if you are not going pure "vintage" why not make the upgrade and know that your intonation is perfect? Here is another view of the bass with the modern bridge. And here is a shot of the vintage Fender bridge. Drill the ground wire channel from the bridge to the control cavity. Modify my pick guard template to match the new neck pocket. I will wait to drill the holes which mount the control cavity - until the pick guard has arrived - and can be used as an exact guide to insure that the fit is perfect. String it up and spend some time doing some simple tests to make sure that the strings line up exactly with the single coil poles and the neck and truss rod are properly adjusted. When Patrick is happy and the bass plays perfectly - I will then go back over and and play the bass for a while before we disassemble it for finishing. We will hold off on the electronics until final set up. Remaining true to the period, I am using the exact burst finish as on the 1954 at the top of the page. Patrick and I spent some time together verifying the playability and then shipped the body out to Pat Wilkens to have the body finished. Then Patrick will get it back from Pat for final assembly and set up. I have been going though a lot of changes on this bass, as mentioned above - I have a white pick guard and the chrome period bridge and pickup covers. I was originally thinking of going 100% out of the Fender box - so it looks the way it did when Fender built it, as pictured first above - but since that time have fallen in love with the streamlined stripped-down look as below. Except for the upgraded bridge, this is a 1954 P-Bass with a contoured alder body. This bass is very unique in that the body is a full size, long scale body - with a medium scale neck mounted on it. The neck is Fender from a Vintage Modified Telecaster bass, which has been tinted vintage amber and refinished in satin by John Ingram and his staff. John is formerly of PRS - and is currently with Knaggs Guitars. The pick-up is a special Seymour Duncan custom "stack" single coil wound at the factory specifically for this bass - and the pots, capacitor, wiring, control cover and knobs are all Fender. It is customized with a special Sun and Moon neck plate. It is finished in a period specific satin 1954 P-Bass burst by Pat Wilkens. The neck pocket and bridge mounts, as well as final assembly and set-up were customized by Patrick Cummings of Brian Moore and iguitars. The bass weighs in at 7.8 lbs and it measures a comfortable 44mm at the nut. Unique Features: I have pick guard, bridge cover and pickup cover, but I have not chosen to mount them on the guitar. I am enjoying the stark and mean look of this bass stripped down.